Sky-Watcher improves on the often unwieldy standard design of Dobsonians with their 14" f/4.9 Collapsible GoTo Dobsonian Telescope. It features a patented truss tube system that enables the front corrector plate/eyepiece assembly to be moved back and locked against the main rear tube to greatly reduce the size of the OTA for storage and transportation. This open OTA also has the benefit of reducing overall weight versus standard Dobs. To add another level of usability to the scope is a motorized ground-based rocker alt-az mount. Equipped with dual servo motors, they are controlled using the SynScan computer hand controller. 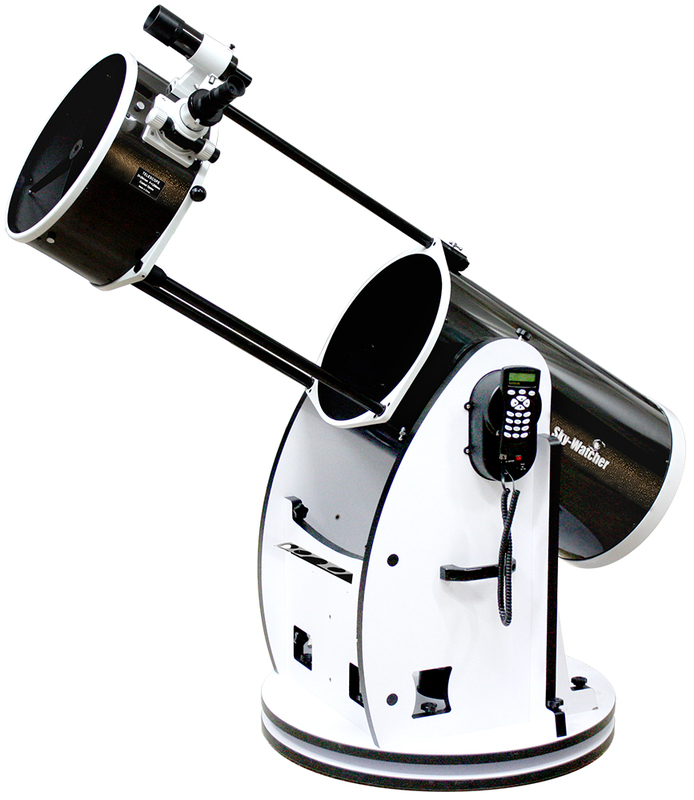 This self-contained system features over 42,000 celestial objects with alignment assistance, guided tours and full go-to capabilities. Its dual encoders, coupled with the patented Tension Control Handle, enable users to manually move the scope without having to realign it. It features an exceptionally large 14" aperture conical parabolic mirror to draw in copious amounts of light to make detailed observations of the Moon and planets, and still reach out past our solar system to discover dim deep-sky subjects that smaller scopes are unable to resolve. A conical mirror, as opposed to a standard parabolic, helps to reduce the mirror's weight while allowing it the ability to more evenly acclimate to the ambient temperature. Its f/4.6 focal ratio and two-speed Crayford focuser makes this an ideal choice for imaging. Its fast focal ratio enables devices to capture images in less time than slower scopes, while the unique focusing mechanism employed in the Crayford-style gives it the ability to achieve tack-sharp focusing with zero back-lash that rack-and-pinion focusers generally are unable to. Box Dimensions (LxWxH) 58.0 x 43.0 x 27.0"